(SitNews) Ketchikan, Alaska - By 1967, visitors had been coming to southern Southeast Alaska for more than 80 years, but compared to the visitor industry of 2017, tourism was still in its infancy. Several small cruise ships had begun serving the area but most had no more than a couple hundred passengers. Only when the P&O Line Arcadia which arrived in 1970 with 1,300 passengers did the ships begin to resemble the leviathans that would arrive in the late 20th Century. Steamers had been arriving in Southeast Alaska since the 1880s, but they were tiny compared to the current wave of ships and, most often, they carried people who were interested living and working in the Last Frontier rather than just looking at the scenery. There certainly were tourists on those early ships (See "A Famous Artist Runs Aground in Loring," SITNEWS, Feb. 13, 2007), and most communities in the region already had curio and jewelry shops to entice the visitors. But most of the steam ship arrivals centered on commerce as the Inside Passage was the only way that goods, services and people traveled between Southeast Alaska and the rest of the world. But in the 1950s, world wide economics dealt a blow to the steamship industry and air travel began to make its mark. In the early 1960s, the new state of Alaska began ferry service between Southeast Alaska, British Columbia and Washington also cutting into the sea based private commerce in the region. By the 1960s, the only non-ferry ships regularly arriving in Ketchikan were Canadian ones; The Princess Patricia and the Prince George. (See "Canadian Liners Once Served Ketchikan," SITNEWS May 23, 2011). But the Princess Patricia, a small coastal ship that carried less than 100 passengers, would be a harbinger of what was to come, even if it didn't seem so at the time. Princess Patricia on her first Princess Cruise - docked in San Francisco - heading south to Los Angeles. As is the case today, wintertime was not a busy visitor season in the 1960s and with the state ferries taking over the role of carrying goods, services and residents, the Prince George and the Princess Pat were usually laid up between November and April. It was a Los Angeles entrepreneur named Harvey McDonald who seized on the idea of using the Princess Pat for three-day excursions between Southern California and Mexico in 1965. McDonald eventually expanded his operation and obtained larger ships, which had something the northern sea sailing Pat did not, air conditioning. But in honor of the Pat, he named his new "line" Princess Cruises, which through clever marketing and a popular television show would eventually become, arguably, the most famous cruise line in the world. In 1967, Princess Cruises chartered the MV Italia, a 492-foot, 425-passenger ship that was caught up in a bankruptcy proceeding. 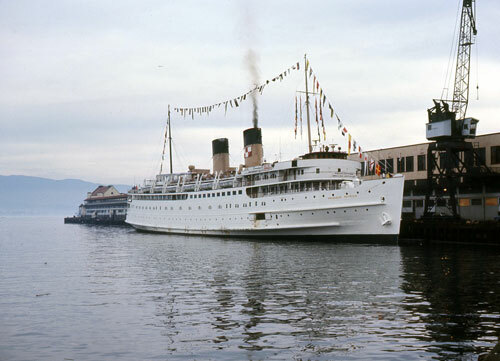 Initially, Princess operated the Italia in Europe and then Mexico, but by 1969 it was making regular visits to Southeast Alaska, frequently having to anchor up in harbors because it was too big to fit at some of the existing docks. Informally, the ship was called the Princess Italia, but the name was not changed on the bow and stern because it was a rental that was eventually returned to its Italian owners in 1973. 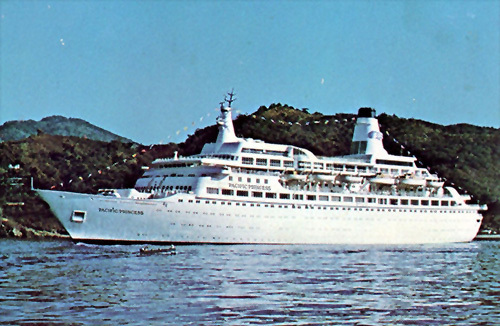 In 1983, the Italia was sold to a new owner that renamed it the Ocean Princess. In 1993, it was sailing the Amazon River when it struck a submerged object near Belem and sank. Although the insurance company declared it a total loss, it was raised, repaired and went back into service as the Sea Prince. 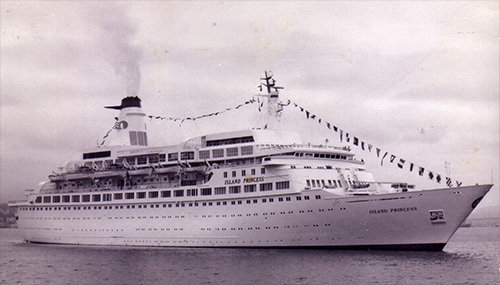 But then she was damaged by a fire and was rebuilt again by a different company which renamed her first the Sea Princesa and then the Sapphire. The MV Sapphire sailed in the Mediterranean Sea until 2012, when it was taken out of service and scrapped, having a 40-plus year career that would be unthinkable in the modern era where cruise ships are deemed obsolete within a decade of launching. 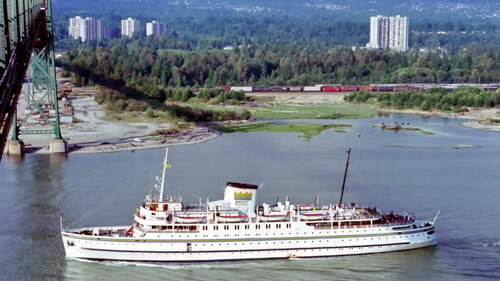 By the early 1970s, other Princess ships were visiting Southeast Alaska, the most prominent being the Spirit of London and the Island Princess. Like many cruise ships of the era, the Spirit of London had a circuitous origin. Originally under construction for Norwegian Cruise Lines as the "Seaward," it was taken over in mid project by P&O Line as the "Spirit of London." Then when P&O purchased Princess Cruises in the early 1970s, the Spirit of London became a "Princess" ship on the Alaska run. initially it remained the Spirit of London and visited Ketchikan numerous times under that name. The 536-foot ship normally carried 700 passengers but on shorter trips it could hold more, making it one of the first 1,000 passenger ships to visit Alaska, although it usually sailed with approximately 800 passengers. Soon, Princess renamed the ship the "Sun Princess." Although not as famous as her sister ship, the Pacific Princess which was the primary "Love Boat", the Sun Princess did indeed get several moments in the movie and television world sun. It appeared episodes of "Columbo" and "Starsky and Hutch" as well as the Love Boat television movie and the theatrical movie "Herbie Goes Bananas." The "Columbo" episode, called "Troubled Waters" was filmed almost entirely on board the ship. In 1988, the ship was sold to another cruise line and renamed the Majestic and then the Starship Majestic. In 1994, it was sold and renamed the "Southern Cross." In 1998, it was sold yet again and renamed the "Flamenco." In 2004, it was sold once again and renamed the ""New Flamenco." It spent its last years operating as floating hotel and then a coastal cruise ship in Asia. Finally, it was abandoned in Thailand, where it eventually capsized and sank in February of 2016. The third early Princess Cruise ship to serve Alaska was called the Island Princess. Like several other early Princess ships, the Island Princess started out elsewhere. 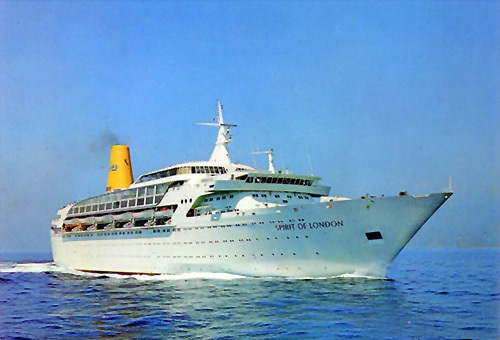 Built in the early 1970s, for Flagship Cruises, as the Island Venture, the ship was soon purchased by the rapidly expanding Princess line. The 554 foot, 700 passenger ship was renamed the Island Princess. It had a long run with the cruise line, until 1999. And the Island Princess was often featured in the "Love Boat" television show that ran from 1977 to 1986 and is credited for significantly boosting the cruise industry. In 1999, the ship was sold to Korean interests and renamed the "Hyundai Pungak." It then became known as the "Platinum" and was sold again in 2002 and became the "Discovery." which primarily sailed in the Baltic and Mediterranean seas until 2014, when she was beached and scrapped. Of course the most famous Princess ship was the Pacific Princess which was the primary ship in the Love Boat series. The Pacific Princess was primarily based in Los Angeles and Miami, but it did occasionally venture north to Southeast Alaska. The 550-foot ship could handle up to 625 passengers. The Pacific Princess was also built for Flagship Cruises and was originally named the Sea Venture. She sailed for Princess from 1975 to 2002 before she was sold and became known simply as the Pacific for the next decade, She was scrapped in 2013. Princess Cruises has continued to serve the Southeast market with a variety of bigger ships, some nearing 1,000 feet in length and with up to 2,700 passengers. New versions of the Island Princess, Sun Princess and the Pacific Princess are now part of the fleet. Princess became part of the Carnival Corporation cruise empire in 2003.